· Onions have also the short-chain fructooligosaccharides, which is a fibre which is digested by the friendly bacteria in the colon (probiotics). Probiotics in turns ferment the short-chain frutooligosaccharides into short chain fatty acid (acetate, propionate and butyrate, lactate and gas), which in turn are food for the colon cells which repair the intestinal tract. The probiotics serves as a defender for the other harmful bacteria and eating onions, asparagus, chicory, Jerusalem artichokes and normal artichokes would promote their health. It has been shown that short-chain fructooligosaccharides also increases the absorption of magnesium. 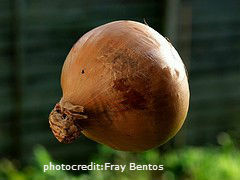 · Because onions are high in flavonoids, especially quercetin, they are good anti-inflammatory foods. Fermented onions have been shown to increase their quercetin amount. Quercetin is a very good antioxidant and anti-inflammatory as it has been shown to stop the inflammatory cascade prostaglandins (Pg1). Also quercetin is a fat soluble and water soluble antioxidant which protect the nerve cells as well. Quercetin is found in high quantity in apples. Antioxidants might still not be destroyed a lot if cooked at a temperature of 50 degree C but the storage will reduce the antioxidants content. The longer you store it cooked and cut the less antioxidant the onions will have. · Onions contains is high in thiosulfinates, a volatile sulfur compounds which gives the pungent flavor of onions and garlic. This compound has been shown to prevent a number of diseases such as high cholesterol, heart diseases, obesity, diabetes type 2 and gastrointestinal problems. Although for some people can actually lead to gastrointestinal problems if intolerant to the compound and as I mentioned above is hazardous for dogs and cats. 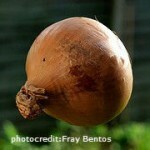 · Onions are also high in the mineral nickel, a mineral that is found everywhere. If you are sensitive or allergic to it then avoids onions and garlic and mushrooms in high quantity. · Other compounds such as glycosylate (phenolic and steroidal origins) have shown medicinal properties such as anti-inflammatory and anti-ulcerogenic activity but only if consumed raw. Funny enough while I was researching the onions properties I got ill with a big inflamed throat and an upper respiratory infection. I knew it was a bad one as my throat suddenly went into fire for two days. I treated myself with cranio-sacral literally all night felt a bit better to work for a little bit and then that was it for 3 days I was out. Treating myself continuously, taking wild oregano, salt throat wash, vitamin C lysine and colloidal silver spray. Ate very warm foods when I could feel hungry. Drank water etc. Then I thought what a better time to try the onion theory. So I did for two days I put an onion under my bed or near my head. I was hoping that it would help, maybe the bacteria and virus could quantum leap into the onion and that would be it. I thought about quantum leap after seeing Brian Cox (and I am sure many did) talking about quantum leap and things moving all the time from one place to another by our atoms moving all the time and shifting all the time. So I thought maybe that is how the bacteria/virus would travel. But with a bit of disappointment, my onions was normal a bit less antioxidant in it but still more or less the same. Nothing unusual on it and I was still pretty ill. So kept taking my supplements and treating myself, had some colleagues treating me with cranio-sacral and did an Epson floating session. All helped so that I did not have to take any antibiotics but definitely not the onions under my bed I am afraid to say. I think maybe for who every tried it there was something in the air that was making their lung weak and therefore by the onion attracted whatever was in the air might have helped their lungs to clear. I cannot say for sure, but I did try…. I still ate the onion in the soup I could not eat it raw as I did not feel eating them, but used a lot of garlic also in my food. In all onions is still very therapeutic for now by eating it or for the painting to it gets rid of the odors… but the house does stink on onions though (I tried that too when I was painting).